When we say Code Handle is an easy way to add PIN security to any interior door, we mean it. 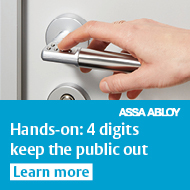 From the minute you open the box, Code Handle makes upgrading internal door security simple. Code Handle is a secure handle with a built-in PIN keypad. It adds reliable electronic security to any sensitive interior door. With Code Handle, you don’t need an expensive access control system. There are no cumbersome keys to carry or track. Its secure PIN code makes sure only authorised people can unlock your door. Press a PIN code on the handle’s keypad and the door opens. Close the door and your Code Handle locks itself automatically behind you. Best of all, Code Handle is simple even for the inexperienced to install. Fitting your Code Handle is easy, as a short YouTube installation video demonstrates. There’s no wiring, no specialist tools, and no need to drill any new holes. All it takes is two screws to fit your new Code Handle to almost any interior door, from 35mm to 80mm thick. An optional distance ring enables installation on even thinner doors. With Code Handle, there is no need to cable the door or connect it to the mains. Code Handle adds electronic security without an access control system. You don’t even need to change your door cylinder. Just slot in two standard batteries, secure your Code Handle on the existing cylinder, and your security is upgraded. When you install Code Handle, you set your own Master Code and can choose up to 9 additional user PINs (4–6 digits). Don’t worry if an employee leaves or changes jobs: you can amend or remove their PIN in seconds, without removing your Code Handle from the door. Code Handle keeps sensitive files, personal belongings and valuable stock separated and secure from the public — and from the moment you open the box. Why did we make the Code Handle so simple to install? Because nobody wants a straightforward security upgrade that needs an expert to fit. https://campaigns.assaabloyopeningsolutions.eu/codehandle .